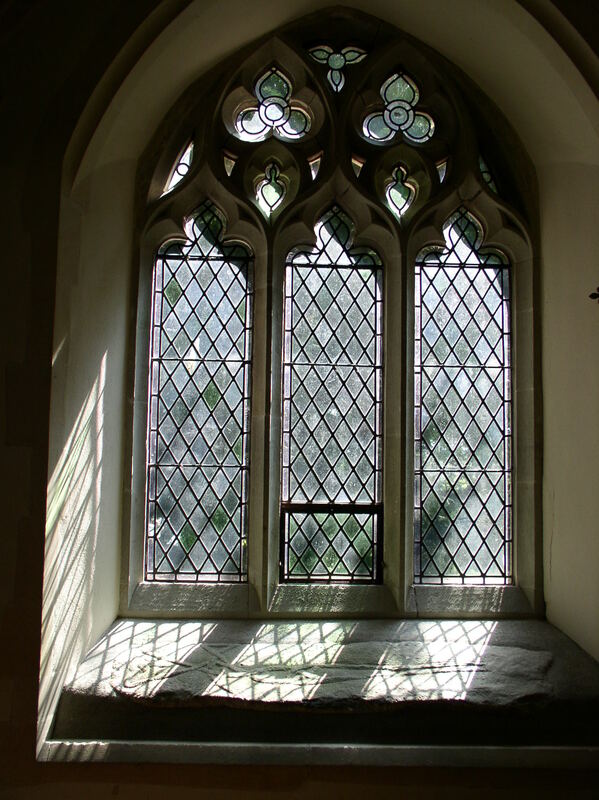 In my previous blog, I published a recent hymn I’d written which focuses on the Trinity. When thinking about what image to present with the text, I quickly decided on the icon of the so-called Old Testament Trinity painted by Andrei Rublev, probably in the 1420’s near Moscow. It is a famous image of the three angelic visitors to Abraham and Sarah (Genesis 18) which has traditionally been interpreted as an epiphany, or revealing, of God. 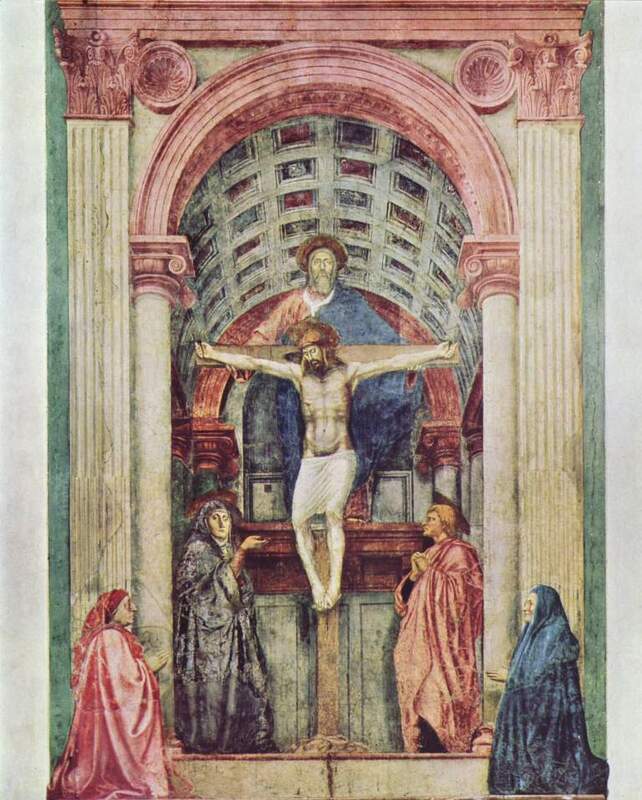 Later, I realized that I had simply opted for the default image – just research how many books on the doctrine of the Trinity published in the last thirty years or so have this image printed on their covers. The image is attractive and intriguing, but its popularity probably also reflects the way in which Eastern Orthodox perspectives have influenced recent theological explorations of the Triune nature of God. This has included a greater emphasis on the relational, or social, dynamics of Father, Son and Spirit, perhaps correcting some of the more hierarchical aspects of some Western theology. I have tried to reflect and celebrate some of this divine interaction – er, I mean Love – in the hymn text. I have tried to think of other images which might be used instead of the Rublev icon – images which might present the Triune nature of God in a way which communicates something significant. The challenge is greater when we consider the reticence there is in portraying God the Father in art. In Eastern iconography it just is not permitted and it would be considered idolatrous. 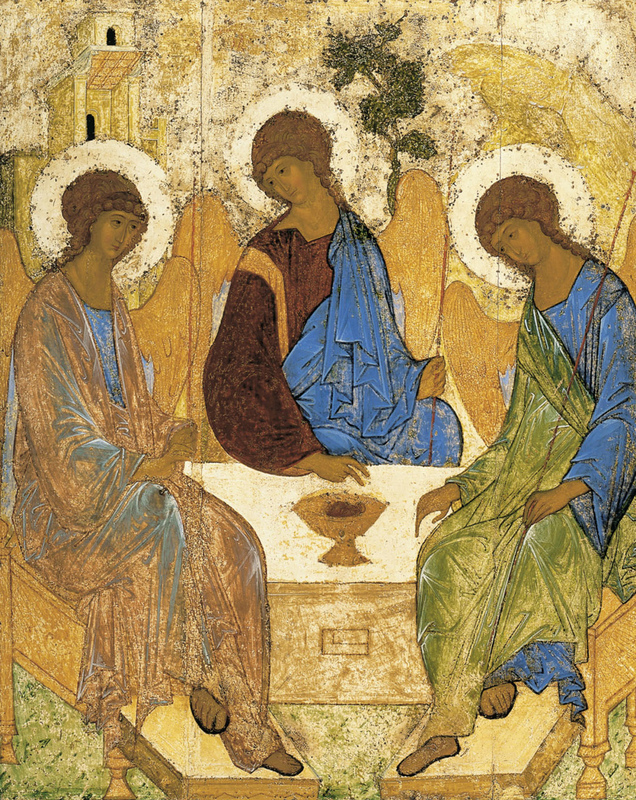 Rublev’s angels are a subtle symbol which avoids this pitfall – another reason for its popularity. Occasionally you may see a hand or an arc in heaven (like on the icon of the baptism of Christ) but that is all. In iconography, the majesty of God is normally portrayed through the icon of the Pantocrator, an image of the enthroned Christ (who is the image of the invisible God – Colossians 2.15). Somehow, the bravura artistry gets in the way of the painting itself and even when we try hard to look through that skill, the image disappoints, at least this viewer. The Father stares stoically into the distance and, while he seems to be supporting the cross, there is little relating going on. The Spirit in the form of a dove darts between the two and we are presented with a moment in time rather than a relating in eternity, which seems to be more about atonement than eternal love. A similar tableau is presented in the stained glass of Prague Cathedral. I’ve not been able to identify the artist but think the window is probably early twentieth century – and would be delighted to have more information if anyone can help here. I took the photo some years ago by resting my compact camera on a friend’s shoulder. The original has striking colours and the image is quite heroic – yet there is the pathos of the Father embracing the body of Jesus (rather like a western pieta where Mary is portrayed embracing the body of her son). Here, however, the Spirit appears more as a witness than a participant so, again, there is less emphasis on the relating of the members of the Trinity and theologians will no doubt comment on this artistic clue about Western perspective which need some Eastern correction. Enter the Cappadocian Fathers and Andrei Rublev again! and love o’erflowed the One in Three. Here is a new hymn text which grew out of a Trinitarian reflection on John 1.1-18. I have a feeling that a couple of the verses are still in process of development, so any suggestions would be grateful received. In the meanwhile, if you wish to field test it in worship then you are welcome to reproduce it provided you acknowledge authorship and source (crammedwithheaven.org). creating both the day and night. a life laid down, a love outpoured. and Christ may all my living fill. Welcome to the new-look crammedwithheaven.org blog and website. If you have been here before, or if you are a follower and have wondered about the site’s inactivity, then I am happy to announce a new beginning. Not only do we have a new and clearer appearance to the site, but the content has been revised and refocused. Most importantly, in its new era there will be regular blogs and an expanding fund of resources on some of the pages. When I began the blog in 2011 I was on study leave in Italy and was reflecting on art and spirituality. 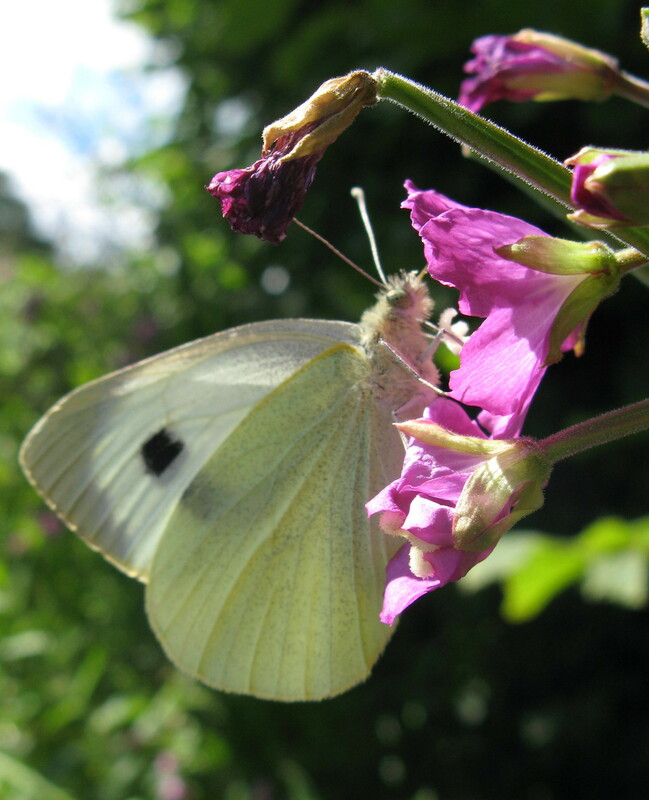 You can still find my musings my Italian Journey page. Since then I have done a lot more painting and, I hope, a lot more praying. You can find some of my more recent art works through the GALLERY menu and there will still be a focus on the visual arts in this site. But I now want to both widen the range and sharpen the focus of crammedwithheaven.org. I hope you find this new era of crammedwithheaven.org both interesting and useful. If you do then please tell a friend! A couple of years ago I was invited to visit Palestinian and Israeli Christians and had the opportunity to visit Nazareth, where a large modern church stands on the traditional site of the annunciation. This beautiful building, the largest church building in the middle east, is enhanced by many modern works of art presented as gifts from around the world. 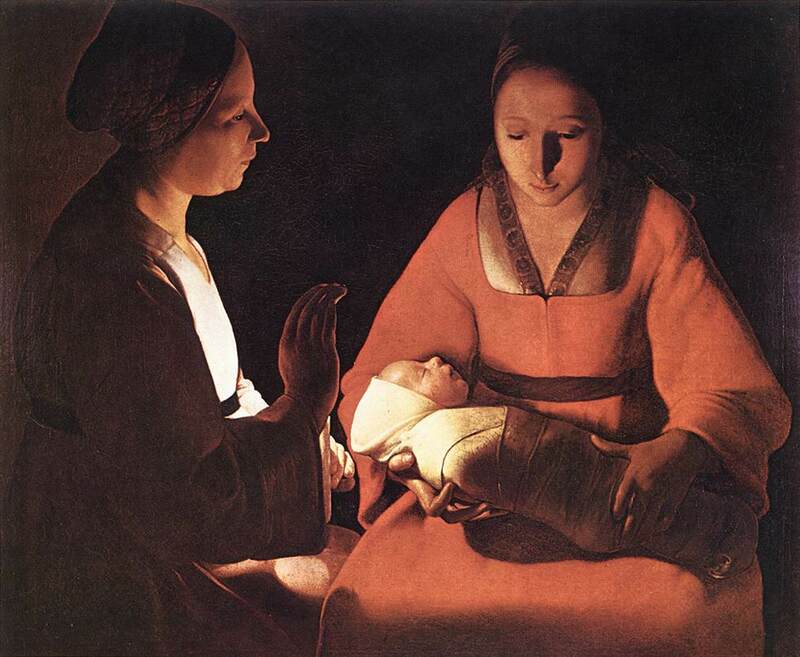 While many different cultures and artistic traditions are represented, the common theme is Mary the mother of Jesus – the story of the incarnation begins with her willingness to carry in her own body the one who will carry the sins of the world for our salvation. The church has a number of large bronze doors on which are depicted scenes from scripture and one which caught my eye portrays the gift of the Holy Spirit at Pentecost. It is a powerful image which presents the twelve apostles, together with Mary, welcoming the Spirit who is represented both as a descending dove and as flames. Go d’s presence is both powerful and empowering and leads to worship and witness. On a lighter note, the image also reminded me of the finale of a West End musical, with the star at the centre and arms raised! As an Evangelical, I have sometimes wondered about the Catholic emphasis on Mary and the encounter with this image was no exception. It reminded me that often, in Catholic art and Orthodox iconography, Mary is represented as being present with the disciples when the Spirit came on the day of Pentecost. It sent me back to my bible to check whether this was ‘just a tradition’ and I found that the apostles returned to Jerusalem after the ascension of Jesus and, staying in the upper room, indeed ‘all these were constantly devoting themselves to prayer, together with certain women, including Mary the mother of Jesus, as well as his brothers’ (Acts 1.14). And then the Pentecost story itself begins in Acts 2.1 with ‘they were all together in one place’. We too are invited to welcome the Holy Spirit into our hearts and lives. Just as Mary’s ‘Yes’ made possible God’s new creation of Jesus within her, so our ‘Yes’ to the Spirit makes possible God’s re-creation of us in the likeness of Jesus. God’s presence in our lives takes on the appearance of Jesus, as the word of love becomes flesh in our lives and actions. Come, Lord, Jesus, come! Build their cold empire on the abstract man. This is always a danger, especially for theologians: to reverse the divine plan and make the personal abstract. Yet incarnation is not abstract, it is down-to-earth religion with a down-to-earth God, born of a woman, pierced by nails and buried behind stone. an event which defies definition? a road of descent from heaven to hell? How can I speak of ‘presence, or ‘glory’? as the Word did not become words, but flesh. What shall I bring to this mystery? Christ in me, the hope of glory. waiting for the ringers’ tug. and silence waits to be filled. is it the presence of God? slowing to the pace of reflected memories? there is room for God.